What is there to say about world famous creator of the PEANUTS comic-strip, Charles (Sparky) M. Schulz, that hasn’t already been said, better, by somebody else? Rather than attempt to be authoritative, let me instead be personal. Charlie Brown and Snoopy are probably two of the first comic characters I considered my own. Thinking back, I can recall the wonder of delving into my older brothers’ box of random comics to look at the drawings, not yet skilled enough at reading to do more than that. It was this box I would return to on quiet evenings spent with father; I would sit on his lap while he held the comic and read the word balloons and narrations I pointed out, sometimes acting out the voices in his deeply accented English. It wasn’t long before I was reading those comics on my own and eventually seeking out newer adventures of Spider-Man, Aquaman and others. But before point I discovered the comics section of the local Daily News. It was there, where poor Spidey was printed in dull black & white, that I discovered Peanuts for the very first time. The artwork was beautifully simple, the dialogue was simple enough for a beginning reader and the strips where funny! A very young Patrick understood that cartoons were meant to be funny, but comics were instead meant to be exciting. Sure, there were the Marvel Super-Heroes and Spider-Man cartoons on T.V. but my younger sister was nowhere near reading age so the Archie, Disney and Harvey comics had yet to enter the house; not that such example could impact what passes for logic to a sullen child just learning how to read on his own. What mattered was that I understood, sometimes all too well, the Peanuts comic-strip; additionally, I was much more able to accurately imitate a drawing of Charlie Brown or Snoopy than I could, a drawing of Spider-Man. As a grew from a child to a young boy my oldest brother took to calling me “Charlie Brown,” an apt description, though my dog’s name was Champ. 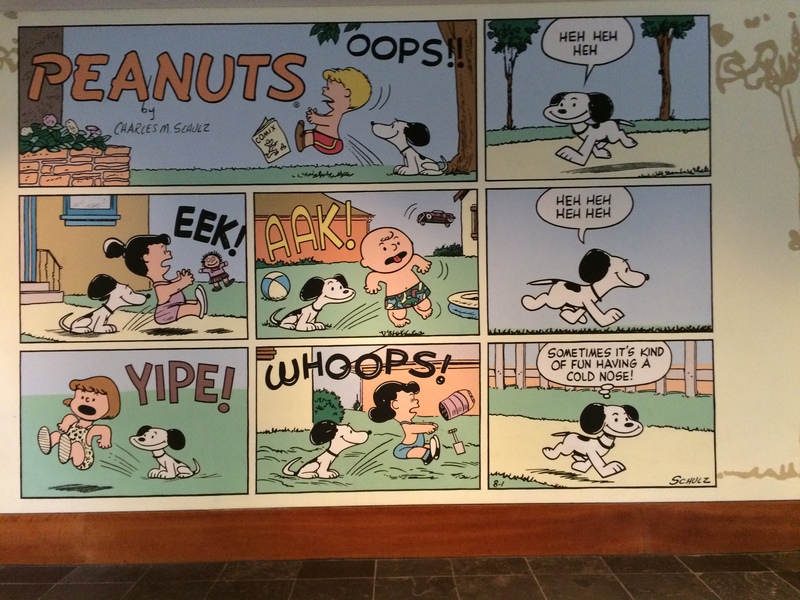 One of several PEANUTS sunday strips to occupy a whole wall at the Charles Schulz Museum. The celebration of my “Birthday-weekend” (other people celebrate birthdays over the course of a weekend right? ) began with the artist’s reception for the 26th Annual Children’s Book Illustrator Exhibit. Lea & I arranged to take that Monday off from the usual work at the Balloon Man and Kung Fu Magazine respectively, a great feat on her behalf considering the number of Bay Area clients that are in constant need of balloons. The afternoon drive into Santa Rosa was pleasant and relatively short, leaving us plenty of time to wander and wonder at this monument to an artist’s life work, the Charles Schulz Museum & Research Center. Snoopy and Lea share a cookie. Charlie Brown statue welcomes all. The joy of sharing a cookie with Snoopy and Woodstock. Fish-Eye view of the museum lobby. As luck would have it, the museum’s temporary exhibit (on display until April 26, 2015) titled Peanuts in Wonderland celebrates the 150th anniversary of the publication of Alice’s Adventures in Wonderland. The exhibit is appropriately immersive, with key holes to peer through and its own Cheshire Beagel. There is a bias towards the Disneyfication of the “Alice in Wonderland” theme/aesthetic, and that’s to be expected, but there are still hints to Alice’s more obscure appeal. There is a broad enough selection of homages to demonstrate Alica’s popular appeal among a wide range of creatives. The flash-free environment and low light setting of the display of older items leaves most of the exhibit better seen in person. The museum theater plays PEANUTS specials and movies all day, we were too engrossed with reading the actual strips to ever make it into the theater. Other documentaries about the museum’s founding or the creation of the PEANUTS Christmas Special aren’t nearly as interesting as the video of Schultz actually drawing. 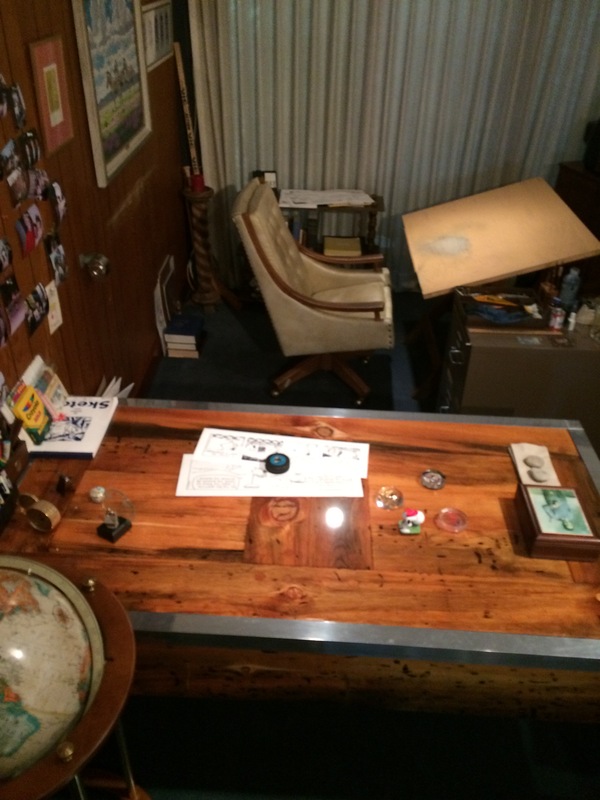 The replica of his studio makes a fascinating time-capsule. There is a profound poignancy to the timing of Charles M. Schulz’s final Sunday comic.